On 16th June 2014 QUECHUANDES’ owners published after three years of hard work the first ever guidebook to rock climbing and bouldering in the Huaraz area. The full colour 376 pages guidebook includes all the region’s best rock climbing and bouldering sites - a total of 23 sites and over 1000 routes! 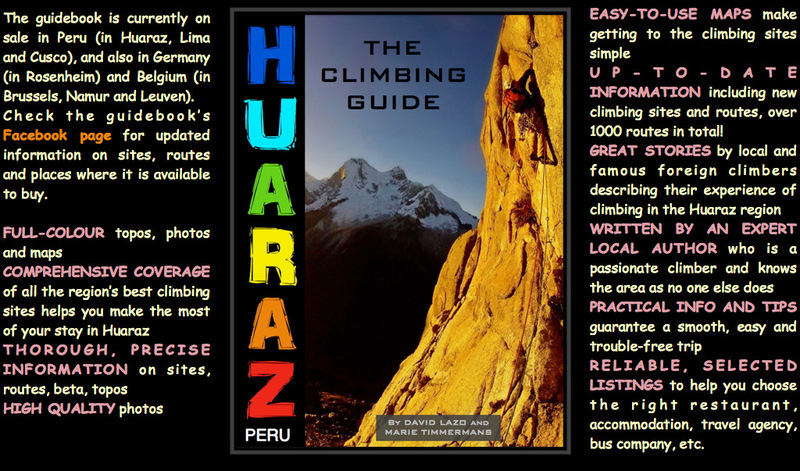 “The Huaraz Telegraph would like to congratulate authors David Lazo and Marie Timmermans on their first edition of the Huaraz Climbing Guide. From what we have seen, it´s a very good example of how guides should be: full of new and up-to-date information, and a prodigious combination of colours, text and pictures. Well done David and Marie, you have every reason to be very proud." Here is an article published in the Huaraz Telegraph with an interview of David Lazo about the guidebook.